Hooray! Another look from Gwynnie Bee! This was a few months back (hence the glasses), but we are just trying to catch up with all of these amazing clothes. I got the chance to wear this fabulous Jessica Howard Ruched Was it Dress with Artichoke Skirt to a company party and I just fell in love with it! 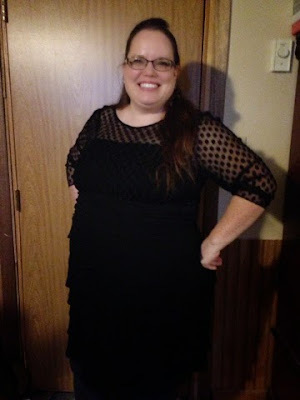 The dress has a keyhole cut out on the back/ neck area, and it was perfect for a fun night out. What is great about the dress is that you can throw on a cardigan and easily make it a day look too! The best part about Gwynnie Bee right now? You can try it for FREE by clicking HERE. FREE! You will get a free trial of 3 garments at a time, and can try it out! This is such a stunning outfit for the company party. I also love party outfits in black. I need to attend a bridal shower at some outdoor Seattle venues and I have bought a beautiful short black dress for that. Very soon I’ll share the photos on my blog!